ORVILLE LEVERNE CLUBB was born on 18 June 1944, in Pascagoula,Mississippi. He attended public schools in both Mississippi and Los Angeles, California, graduating from Garfield High School, Los Angeles, in 1962. He then spent more than four years as an enlisted man in the U. S. Marines achieving the rank of Sgt. (E5) prior to being released from active duty in late 1966. As a civilian, he started in the ICT field in late 1966, at the Bank of America in Los Angeles and then at the Bank of Hawai'i in Honolulu. In August 1977, he moved to Hong Kong as a Senior lecturer at the Hong Kong Polytechnic. In the 1970s up to his retirement in 2009, Lee Clubb held many posts in South East Asia, in both academia and the computer industry. In higher education, he has been Dean of an Engineering and Technology Faculty, Acting Dean of a Business Faculty, Associate Principal of a large college, Head of an academic division, and an Associate Head of an academic department. In industry he has worked mostly in banking but was the Systems Support manager for Burroughs (HK) in the 1980s. Dr Clubb holds a BA degree in Psychology from the University of Hawai'i, a Diploma in Chinese Law from theUniversity of East Asia, Macau (now the University of Macao) and a PhD in Computing from The University of Sunderland in the UK. Now retired, he commutes between Hong Kong and Hawai'i, where he has a macadamia nut and coffee farm. 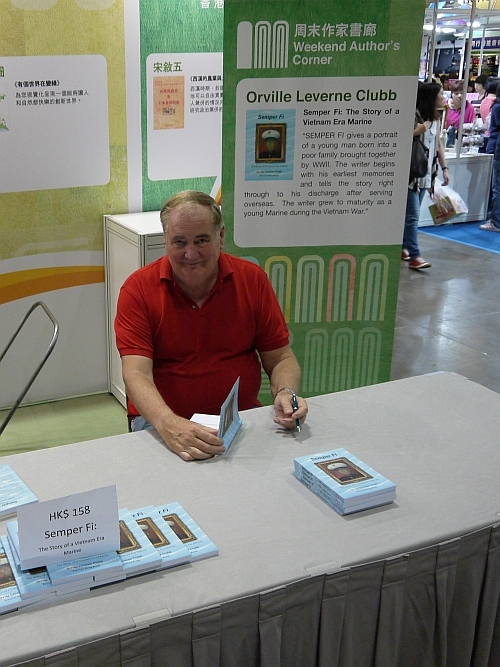 Lee Club's book, "Semper Fi: The Story of a Vietnam Era Marine" was launched by Proverse Hong Kong on 23 March 2012 in Hong Kong. To purchase from this site, go to the Memoirs page and use the PayPal button (enables credit card purchase). Lee Clubb (Semper Fi! The Story of a Vietnam Era Marine) signed his book at the Authors' Corner.